Laura loved exploring the plum thickets with her sister Mary and would carefully shake the trees so that only the ripe plums would fall. Mary teased her for eating more plums than she picked but who can blame her for enjoying those sweet, juicy plums. There’s nothing like the taste of fresh summer fruit. It’s one of those things that we daydream about on a frigid winter day. 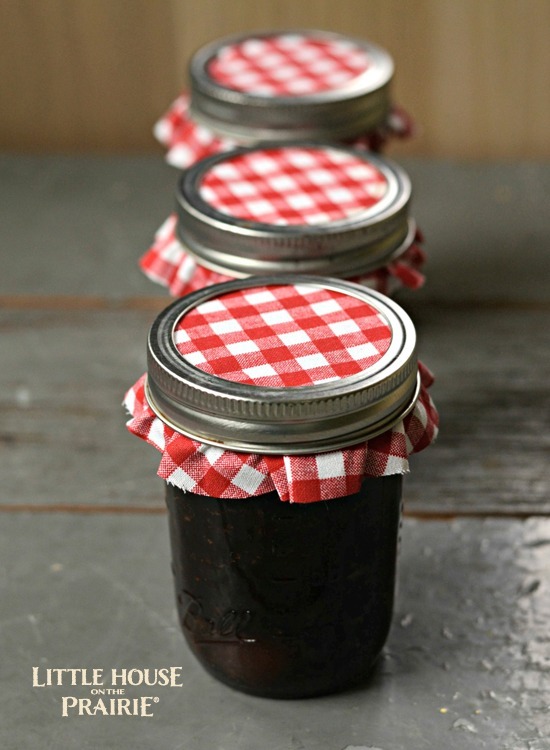 Fortunately, that delicious summer flavor can be captured in a jar and enjoyed all year long with this recipe for old-fashioned plum preserves. 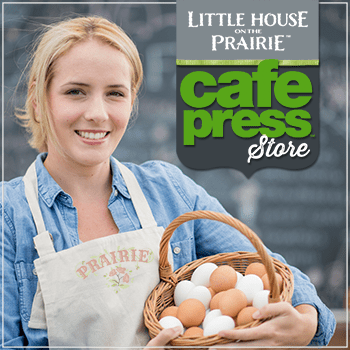 Food preservation has been an important facet of life for centuries. 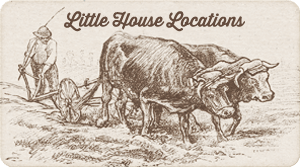 In pioneer times, many fruits, vegetables, and meats were dried for future use. In On the Banks of Plum Creek, Ma, Laura and Mary dried their plums in the sun and saved them for the winter. Pioneer women also pickled vegetables so the summer harvest would last into the winter, but canning standards were different back then. 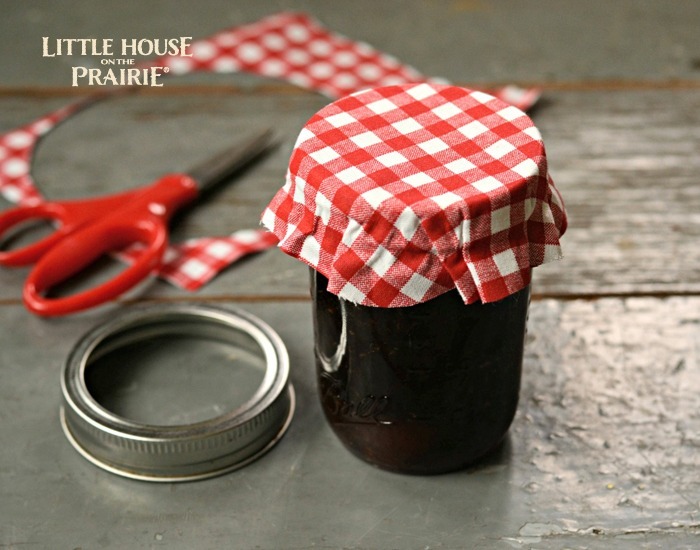 Ma Ingalls would have used a wax seal to close off the jars from her summer canning. Current guidelines for safe canning typically call for a two-piece lid and ring set and a boiling water bath to seal the lid. You can use a water bath canning set specifically designed for canning, or convert a large, deep saucepan by picking up a canning rack that fits. 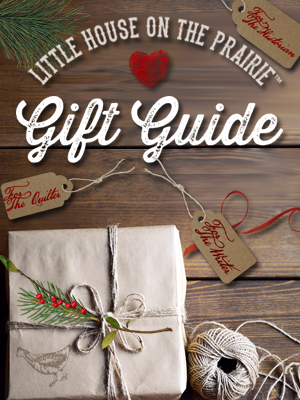 You’ll also need your glass jars, new lids and rings, and a headspace tool at the minimum. 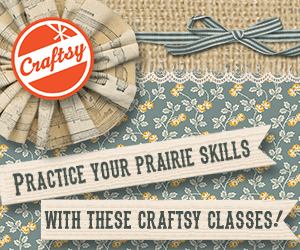 Most beginning canning sets will include everything you need to get started. 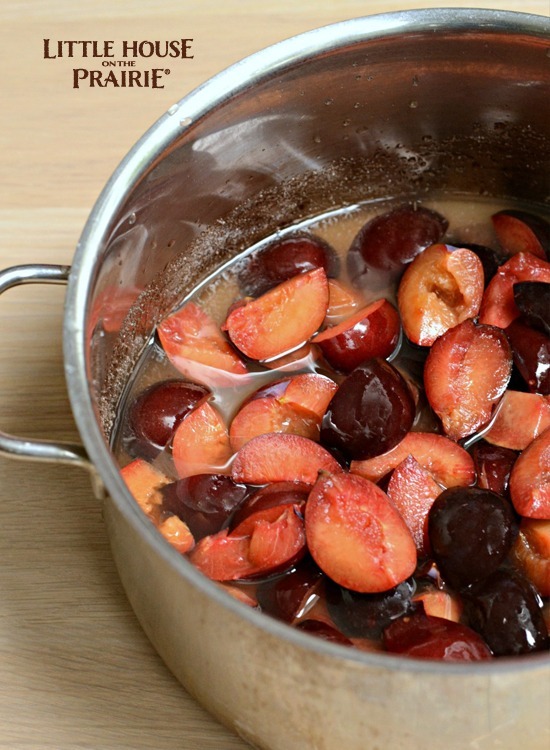 This recipe for canned plum preserves comes from the Ball Blue Book Guide to Preserving. A simple combination of sugar, water, and plums, these preserves are the perfect combination of tart and sweet. They taste divine on a piece of toast or a warm biscuit. Bring the mixture slowly to a boil, stirring until the sugar dissolves. As the mixture thickens, stir it frequently to prevent sticking. The thickening process can take up to 45 minutes. The preserves are ready to can when they begin to thicken, but are not yet gelled. The mixture should still be a little watery because it will continue to cook during the canning process. If you over-thicken it to the point where it looks like jam, the preserves will be difficult to spread. Remove the preserves from the stove and skim the foam off the top. Ladle the hot preserves into hot, clean jars, leaving ¼-inch headspace. Adjust two-piece caps (the lid and ring) on the jars, and process for 15 minutes in a boiling-water canner. For more information about safe canning procedures, I recommend this guide to water bath canning from Ball Canning. 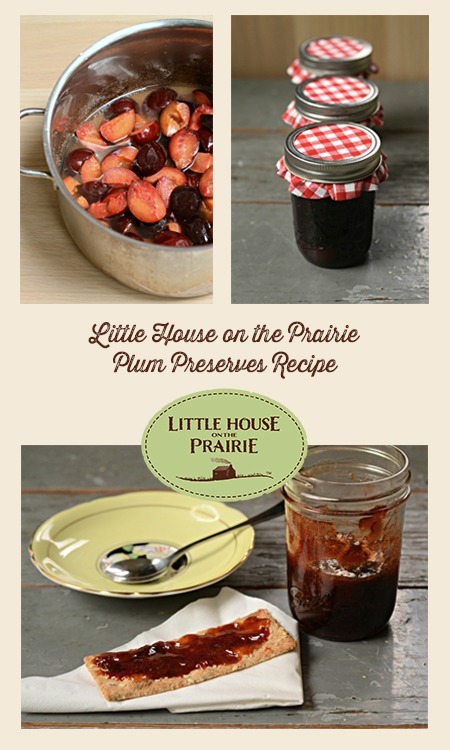 These plum preserves also make a wonderful hostess gift. For a nice presentation, you can decorate the jars with a fabric cover. To do this, cut a piece of light fabric into a circle that’s about two inches wider than the jar. This will give you an inch of fabric to hang down all around the jar. Place the fabric on top of the sealed lid, and affix the lid ring on top of the fabric to secure it in place. 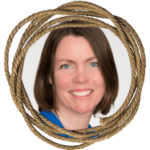 Ginger Plum Preserves – These flavorful plum preserves by Shaina bring a healthy, exotic feel to the sweet plums by using fresh ginger. 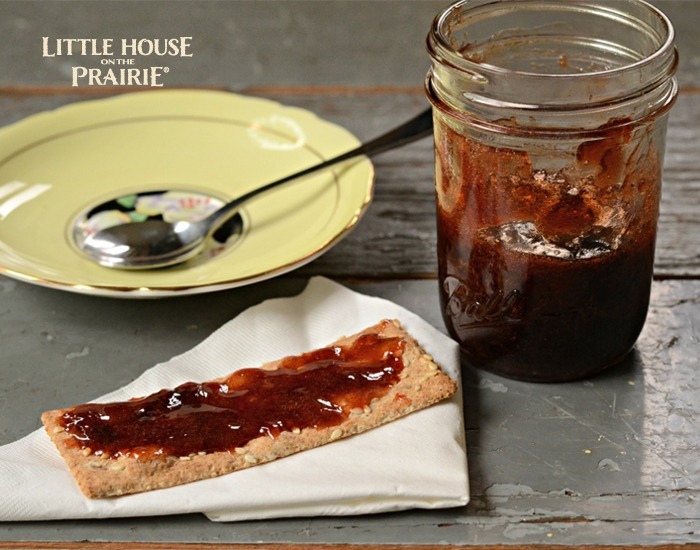 Spiced Plum Preserves – These seasoned and spiced plum preserves became a family favorite, topping everything from ice cream to oatmeal. Plum Vanilla Preserves – Vanilla and cinnamon combine with summer’s sweet plums to create a delicious flavor worth using year-round. Mint and Cinnamon Preserves – Bring a bright flavor to this cinnamon seasoning by adding fresh mint leaves during the cooking process. 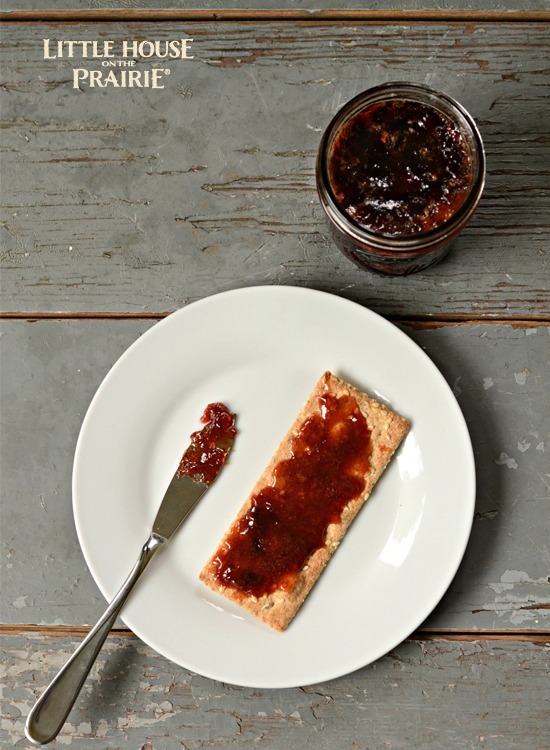 Rum Vanilla Plum Preserves – This variation is rich and warming, perfect for fall desserts. Plum Jam with Lavender – Lavender is an herb prized for its lovely fragrance and can add a nice floral flavor as well. If you’ve never tried canning before, you will love how easy water bath canning can be. 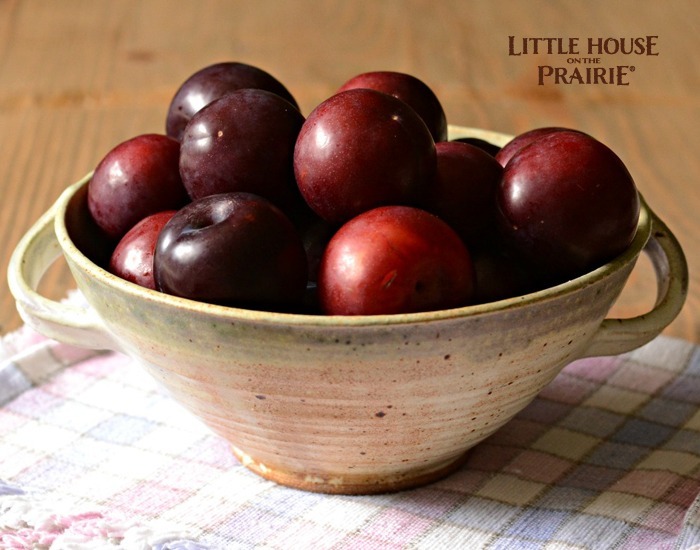 What is your favorite way to use plum preserves? Do you enjoy combining them with spices and herbs? 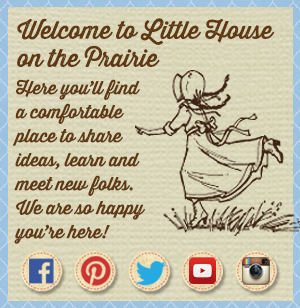 Remember to subscribe to the free Little House on the Prairie newsletter for more inspired recipes and gift ideas. I would like more recipes for canning jelly or jams. Hope its as good as it looks the 1 that Had the ginger in itSounded so good. My preserves did not thicken! It is very good but just not thick, where did I go wrong?